The Louisiana-born and California-raised Wilson was the Astros’ top pitching prospect entering the 1967 season. In the previous two campaigns in the minors, Wilson had put up gaudy numbers; first in the Class A Florida State League (1.44 ERA in 181 innings) and then in 1966 with Amarillo in the Double-A Texas League, where he posted an 18-6 record and a 2.21 ERA, and struck out more than a batter an inning. Wilson had experienced some growing pains thus far in ’67, such as surrendering five hits and four runs without registering an out in his second start of the season; however, he had flashed the brilliance that made the Astros’ brass hold their breath. In his previous start, on June 14, he punched out 13 San Francisco Giants while scattering eight hits and surrendering just one earned run in a complete-game 7-4 victory. Wilson tossed 155 pitches in that contest, causing Hatton to doubt whether he should start the youngster on three days’ rest on June 18. With his club in ninth place (25-38), 14½ games behind the Cincinnati Reds, Grady decided to go for broke and monitor the rookie closely. A Father’s Day crowd of 19,199 was on hand in the Astrodome to see Houston take on the sixth-place Braves (31-29) in the fourth and final contest of a weekend series. After dropping the first two games, Houston picked up a win when graybeard Eddie Mathews belted a walk-off home run to lead off the ninth for an exciting 4-3 victory in the second game of a twin bill. Wilson had some concerns facing for the first time the heavy-hitting but free-swinging Braves, who led the NL in home runs in 1967. “I had intended to throw a lot of changes,” he said. “But I had a real good fastball in the first inning and decided to stick with it.”6 The 6-foot-2, 200-pound right-hander mowed down the first 14 batters he faced, seven of them by punchout. Facing the Astros was 28-year-old right-hander Phil Niekro, making just his third career start. A reliever since he debuted with the Milwaukee Braves in 1964, the knuckleballer had baffled opponents in 24 relief appearances in ’67 (1.73 ERA) before tossing a masterful two-hit shutout five days earlier against Philadelphia. The Astros tagged Niekro for two hits in the first, but he otherwise matched zeros with Wilson in the first three innings to extend his scoreless streak to 14⅔ innings. Houston ended that streak in the fourth when Sonny Jackson led off with a single and scored on Jimmy Wynn’s double down the right-field line. It was the Toy Cannon’s league-leading 48th RBI of the season. Wynn moved to third on Rusty Staub’s single and scored Houston’s second and final run when Mathews grounded to second, forcing the slow-footed Staub. Wilson seemed flustered in the seventh when he issued a one-out walk to Hank Aaron on a 3-and-2 count, prompting the first and only mound visit by his skipper. Moments earlier, Adlesh had failed to hold on to a third-strike foul tip. “I just went out there to tell him to slow down,” said Hatton. “Never mind Hank. Keep your concentration.”9 Wilson subsequently fanned Mack Jones and retired Mike de la Hoz on a fly to center. “I was petrified,” admitted Wilson bluntly after he game. “I knew I had it. In the eighth inning I checked to see when Aaron would come up. … I didn’t want to face him again.”10 But when Wilson issued a leadoff walk to Menke in the eighth, he was assured of facing Hammerin’ Hank one more time. With the tying run at the plate, Wilson fanned the next three batters, all pinch-hitters, to set up a meeting with history. “I could hear the fans when I walked out for the ninth,” said Wilson.11 Tuning out the screaming crowd, Wilson fired a fastball to Alou, who hit a high pop fly above the catcher. According to the Chronicle’s John Wilson, Adlesh turned the wrong way and lost the ball against the backdrop of the Astrodome’s ceiling. Aspromonte rushed in from third and made a spectacular catch “almost behind home plate” for the first out.12 After Wilson fanned Tito Francona, only Aaron stood between him and a no-hitter. “I got behind, then I threw my fastball,” explained Wilson after the game. “It was 3-and-2 and I decided he’s going to break up the no-hitter or I’m going to get him out.”13 Aaron fouled off a pitch and then took a mighty swing at the next offering and missed. Wilson “finished in a blaze glory,” wrote Joe Heiling, striking out five of the last six batters he faced to complete the no-hitter in 2 hours 35 minutes as his teammates mobbed him on the mound. It was the first no-hitter in the National League since Sandy Koufax tossed his fourth and final no-hitter on September 9, 1965, and the first one by an NL rookie since Chicago’s Sam Jones blanked Pittsburgh on May 12, 1955. Wilson improved his record to 4-3 and lowered his ERA to 3.12 in 80⅔ innings. Niekro gave up eight hits in seven innings and was collared with the tough-luck loss. Braves catcher Bob Uecker provided some comic relief to the situation: “I’m having to catch Niekro and his knuckleball and hit against Wilson.”16 Uecker dropped 13 knucklers, including two on two-strike counts, and fanned once before being lifted for pinch-hitter Rico Carty in the eighth. The mood in the Astros’ clubhouse after the game was jubilant, as expected. Majority owner Roy Hofheinz, a fixture at the Astros’ home games, missed the historic contest preparing for a trip; however, the former mayor of Houston, affectionately known as the Judge, had a case of champagne delivered to the players. The Chronicle and Post reported that the ecstatic Hofheinz ripped up Wilson’s contract and gave him a new one with a $1,000 salary increase. Wilson’s no-hitter was the first in the Astrodome and the third in the franchise’s history. In an odd twist, neither of the first two no-hitters resulted in a no-hit, no-run game. Both occurred in Houston when the club was called the Colt .45s and played their home games in Colt Stadium. Don Nottebart tossed a no-hitter on May 17, 1963, yet surrendered a run to Philadelphia. 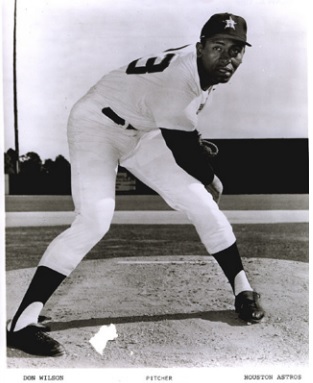 Ken Johnson lost his no-hitter, 1-0, to Cincinnati on April 23, 1964. “I’ve never had a better fastball,” said an ebullient Wilson after his no-hitter.18 His 15 punchouts tied the team record set by Mike Cuellar a year earlier; and his 28 strikeouts in two consecutive starts were a new team record. On July 14, 1968, Wilson set a Houston record by striking out 18 against Cincinnati at Crosley Field; the following season, he tossed his second no-hitter, fanning 13 Reds at the same field, on May 1. 1 John Wilson, “Astros’ Wilson Fans 15, No Hits Braves,” Houston Chronicle, June 19, 1967: Section 2, page 1. 2 Wayne Minshew, “Don ‘Changed’ to Fastball,” Atlanta Constitution, June 19, 1967: 16. 4 Joe Heiling, “Wilson Admits He Was ‘Petrified,’” Houston Post, June 19, 1967: Section 4, page 1. 5 Wells Twombly, “Day of Greatness,” Houston Chronicle, June 19, 1967: Section 2, page 4. 7 Joe Heiling, “Wilson Fans 15 Braves in 2-0 No-Hit Classic,” Houston Post, June 19, 1967: 1.